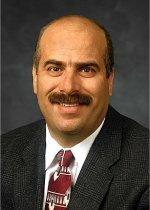 Congratulations to Dr. Moe Khaleel, director of the Computational Sciences and Mathematics Division, and a Pacific Northwest National Laboratory Fellow, on his selection as a Fellow of the American Society of Civil Engineers. He was recognized for "distinguished contributions to the field of computational engineering sciences, particularly computational multi-physics modeling of complex systems." The ASCE is the oldest national professional engineering society in the United States. The organization's mission is to "provide essential value to our members and partners, advance civil engineering, and serve the public good." ASCE fellows are legally registered professional engineers who have made significant technical or professional contributions and have demonstrated notable achievement in responsible charge of engineering activity for at least 10 years following election to the ASCE grade of member. As director of PNNL's Computational Sciences and Mathematics Division, Khaleel leads the effort to provide scientific and technological solutions through the integration advanced computing, mathematics, and computational sciences to advance the Laboratory's science, energy, and national security mission areas. He is also a Fellow of the American Association for the Advancement of Science and the American Society of Mechanical Engineers.